Had a good day, got to work early and had a productive morning. Rob is out on Family leave, Mike called in sick, and Jason was out with a sick kid so I was flying solo. Worked 'till noon and then took off to have lunch with Bobby. He had the kids so I drove to his house and he made Panini's. We hung out and got caught up. I told him about my anniversary plans for Robin and he told me about his Birthday plans for Herlin. It was fun. Back to work and put a pretty good dent in the module specs but not sure we will finish on time with everyone out. We have till tomorrow to get them all done, I may have to go in early and stay late. Took off earlier than I had planned because Kayla drove down to see me and my parents. I showed up at my parents and had a good visit. Kayla and Peyton came back to my place for a quick bite to eat and to give Nanna hugs before they took off. Robin went back to sleep after her hugs and Kayla took off with Peyton so I grabbed the camera and took off on a mission. 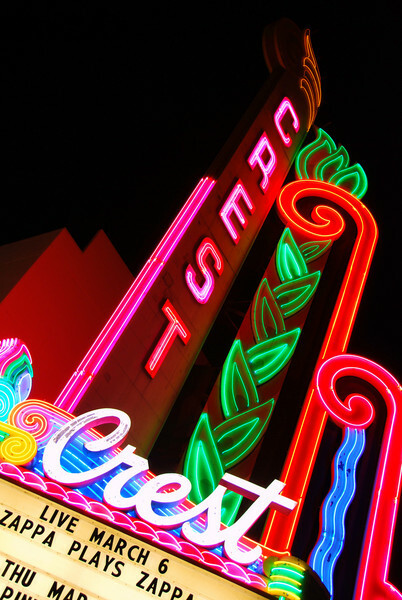 Neon has been good to me the past couple of days so I ran downtown to grab a shot of the Crest Theater Marquee. I watched my friend Shilpa, and her hubby become US citizens here, it is a very nice and historic theater. It is Shilpa and Sridhars Anniversary today, Happy Anniverary! Grabbed some shots of the Cathedral while I was there and ran back home to post my photo in time to run off and pick up Brandon. Talked to Melody for 20 mins while posting photos, they are all doing well. I love the perspective and color on this. Great job! Cool angle and colors! Awesome! I love all these great color lights too ! And the nice pictures of them you compose ! I'm loving this series of neon you have going! Love it! You captured very well!